I’m super excited to introduce to you my ride or die daytime bag. It’s ethically made with quality materials, is sustainable, and supports local artisans. Yea, it’s kinda perfect! This bag is the perfect slouchy everyday, "throw-everything-in", kind of bag. It goes with everything and has a relaxed hobo shape, with a structured bottom that ensures it maintains it’s half moon silhouette. The shoulder strap is sturdy and thick. It's the perfect width, sitting comfortably on your shoulder without cutting into flesh. The bag dimensions are 30 (l) x 30 (h) x 14 (w) cm. Despite it’s size the bag isn’t heavy at all! The bag is made of Printed Nubuck Leather and feels soft but sturdy to touch. This is, however, top grain and not full grain leather. This means they have buffed off the top layer due to imperfections and embossed it with a texture plate on top. This gives it that cross texture while still having the "velvet nap" finish that is typical of full grain Nubuck leather. They do this because their leather is "salvaged", meaning it would have otherwise been discarded because of slight imperfections. This of course makes it lower quality than full grain, but I'm ok with this, because in using salvaged leather they've reduced wastage and are supporting sustainability. ***Note they do have bags made of full grain leather (also salvaged but with few enough imperfections not to buff down) that have not been buffed down, just look for descriptions that don't include 'printed'. Them most important indicator of quality is their refusal to use split grain leather (low quality leather that is made from scraps bonded together) and only work with top grain and full grain . The bag color deepens with use as most vegetable tanned leathers do on exposure to the sun. Scuffing only adds to the patina, that bronzey aged look of older leathers. You can soften any harsh marks by brushing them out with a soft brush. My favourite detail on this bag is the outer compartment's magnetic closure. It makes stashing valuables like your keys or card incredibly easy, while ensuring they’re secure. I assure you, even when the bag tumbles, that compartment stays firmly shut. The strap of the bag is attached via light gold metal hardware. The zipper tab is made of a slightly darker leather, punctuated with decorative brass pins. The hardware is of good quality, and the zips all work smoothly. The bag has an outer rear pocket that fastens magnetically as I mentioned above. 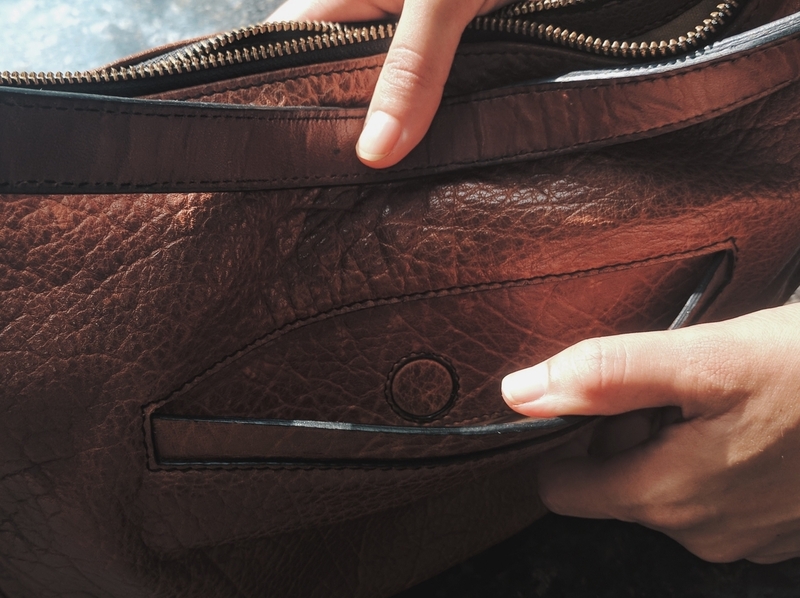 The inside has a zip pocket on one side, and two smaller slip pockets on the other, the perfect size for your cellphone, or small knickknacks like pens or loose change. The main inner compartment is undivided. I included this because misleading, retouched images are a HUGE pet peeve of mine. It’s an obvious pitfall of online shopping, but it just irks me when companies are so blatantly dishonest. The Chiaroscuro site pictures the bags worn by their own staff, in natural lighting, with no retouching. I can attest to the fact that what you see is what you get. I love how transparent this brand is, and it’s a great example of how a sustainable company should function. Every bag also comes with a one year warranty, and you can send your bag back for any repairs free of charge. You can get any of the bags Monogrammed for an extra $4.50. It's a great touch especially for a gift. If you want to customise the shoulder strap, the compartments or make any other small changes to the style of a bag, there is a section called Made to Order, and any of the bags in this section can be custom made to your preferences. They offer international shipping via FEDEX. Overall, this bag is one of the most treasured serendipitous additions to my closet this year. It was actually a gift for my boyfriend’s mother, but she’s vegan, so the bag eventually came to me, and boy am I glad it did. It’s worn well despite my rough. every day use, is super versatile, and the design is extremely utilitarian. This is a brand that you should definitely check out if you're in the market for a new leather bag!